The 70-foot wooden boat was taking water, according to Miami Herald, the U.S. Coast Guard launched a small boat to attempt to rescue all the Haitians onboard. 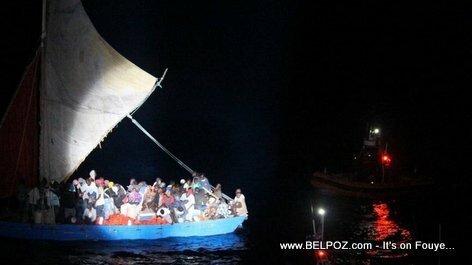 50 of them took the help from the Coast Guard, the remain 77 refused to accept life jackets and remained on board as the boat drifted into Cuban waters. All 50 Haitians rescued by the U.S. Coast Guard were sent back to Haiti Tuesday. The other 77 were caught and taken into custody by the Cuban Border Guard. It is not known as yet if they will remain in Cuba or be sent back to Haiti. There are no jobs in Haiti. Desperate Haitians are trying by any means necessary to reach any other foreign land with hopes of a days pay, no matter what the cost. Why! They have to leave? I got to interview these people. Yap konprann, yo pa bezwen tande, yo pa bezwen wè, yo pa bezwen konnen, yo fou, yo anraje. yon sel bagay kite yo fe wout yo tankou bèt e se pa tout bèt. Yon sel bagay pou tout moun ki vle pati al nan yon lot peyi kon nen ke lot peyi sa a pa pitimi san gadò.